In Steep, you land on the snowy mountains of the Alps and Alaskas and can practice in 4 different extreme winter sports. Snowboarding, Wingsuit flying, Skiing and Paragliding. The mountains are waiting for you to be explored, because next to the practice of sports some other challenges await you. You can play Steep on consoles PS4 and Xbox One as well as on the PC. 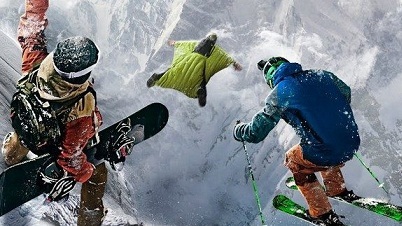 On the PC, you can play Steep with or without the controller. However, this is bit strange at the start and that is probably the reason why Ubisoft released a tutorial video for PC gamers on YouTube. So definitely you should start with the tutorial and follow the guide, which introduces you to the game. Here you try all sports through once and need to fulfill small tasks or goals. You follow a line where you can orient yourself. So you see how you going to move in the further course of the game and what distances you should keep. Especially the first flight with the wingsuit is a real adventure, in which the distances you have to be properly assessed. Otherwise you end up very quickly in the snow. However, you also get the most points when you fly with the Winsuit as close as possible above the ground. - Planning Is Everything: If you find the next exit or next door, then you need not worry about having that you must go down perfectly right the first time.You can use the first departure to get an overview of the route. So you can plan the perfect course. This includes various tricks that you could perform at a special place on the slopes. Once you have arrived in the valley, you can just re-start the run and go back to the starting point to rerun it and get points. - No Time To Waste: A restart of departure is incidentally also always useful if your current exit is just littered only as of falls or other errors. With this you can hardly collect good points. So don’t waste any more time and start again. After all, you want to get the best performance. You can run down a slope as often as you want. - Use Quick Trip: Of course you can also go through the deep snow to trudge and so reach the slope upward again - quite realistically halt. Or, you use the speed trip, because it is much faster. Steep explains to you in time, as the Fast-Travel function works. Sometimes you land in nothing and then you can simply use the speed trip to explore the mountains further from this starting position or to go down the slope again. - Practice, Practice, Practice: the example with the Wingsuit shows that practice makes definitely a champion out of you. Repeat the slopes and the events to beat your own best times and practice. Timing is worth much. If you are able to get the maximum number of points at the light events, then you will also find heavier slopes easier in the future. Also the comparison with friends can increase your ambition. So try to beat the times of your friends. - Look Into The Distance With Binoculars: You can use your binoculars to see the beauty of the mountains in more detail, but the binoculars has a better benefit. In Steep, a huge, open world awaits you and you don’t lose in it, you can get your binoculars and look around you. So you can find great spots, but also new events and other slopes. - Best Jumps: Especially when snowboarding it depends on skilful and high jumps. To put a lot of energy into a jump, you should start it out of the squat. In general, you should always be as straightforward as possible to drive on the ramp, the rock or the house roof and keep the jump button pressed. After jumping, you can turn by simply changing your direction. But be careful not to overthrow your landing position. You also lost points. - Use Routes: The routes are varied. You will find ramps, rocks, which you can also use as such or snow-covered roofs. In addition, you can drive through the trees in the slalom and use other places for great stunts. The routes offer you plenty of ways to earn points by using jumps and stunts. Also try the grabbing (R1 / RB) during the snowboarding, where you touch the board while you are floating in the air. This brings you great points. So try everything out on the downhill and experiment a little around. Steep sees itself as a realistic extreme sports simulation for winter sports. You can discover hidden places when you're on the go and have fun with your friends. You can find the sports wild mix together and try everything that comes to mind. In addition, you have the opportunity to share your routes or try out a track of your buddy. There are always special challenges, where you participate and can win medals. For example there are challenges such as Big Air contests, Proximity Flying or spectacular forest slalom runs that demand you a good reflexes. In addition, you can do quests that will give you the secrets of the mountains. Take as much as you can.